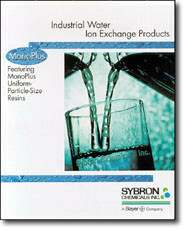 Sybron Chemicals Inc., of Birmingham, N.J., has published a new product guide highlighting its complete line of Lewatit ion exchange resins for industrial applications, including Monoplus uniform-particle-size ion exchange resins. The monodispersed resins, available in both gel and macroporous varieties, have been tested and proven in a host of worldwide applications. Typical uses include condensate polishing, cocurrent softening and demineralization.